Once a year, Scoutmaster Tim Riggs leads a troop of boys into the Canadian wilderness for a weekend camping trip—a tradition as comforting and reliable as a good ghost story around a roaring bonfire. But when an unexpected intruder stumbles upon their campsite—shockingly thin, disturbingly pale, and voraciously hungry—Tim and the boys are exposed to something far more frightening than any tale of terror. The human carrier of a bioengineered nightmare. A horror that spreads faster than fear. A harrowing struggle for survival with no escape from the elements, the infected…or each other. Part Lord of the Flies, part 28 Days Later—and all-consuming—this tightly written edge-of-your-seat thriller takes you deep into the heart of darkness, where fear feeds on sanity…and terror hungers for more. 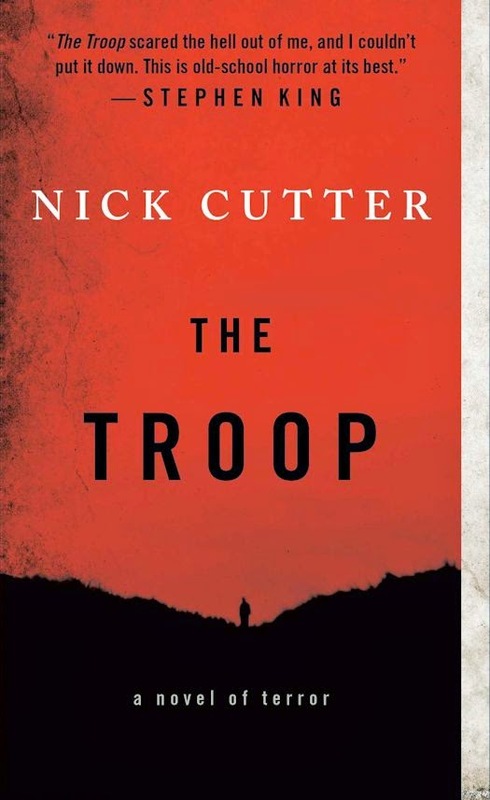 The Troop is my second horror book for the month of October. I like reading books that creep me out to get me in the mood for Halloween and fall. While my previous book was family friendly, The Troop isn't for children. It's also not for the squeamish reader since it takes some dark turns. I honestly had to stop reading the book at times to take a break. Nick Cutter is a gifted writer of disturbing scenes and doesn't shy away from the use of gore, and I mean gag-inducing gore. Now, I would like to give a disclaimer for those of you out there who like watching The Saw or, heaven forbid, Mordum, to calm yourselves down before bed, you might not blink an eye at the events in this book. For the rest of us, it'll do its job of creeping you out. As the title suggests, all of this alarming stuff is happening to 12- to 15-year-old boys on a boyscout adventure. For me, this is what made it almost unbearable to read. The things these boys go through are pretty grusome. As a parent, I can't imagine something like this happening, and sadly it's not that hard for this book to be reality. Cutter does a great job of developing some of the characters quickly to establish an emotional connection for the reader while some of the boys still feel a little cardboard. Cutter also openly borrows a writing technique from Carrie by injecting newspaper articles, blogs, court records and even psychological records to give the reader additional information about what's going on off the island and after the events. I enjoyed these a lot as they tease the reader into trying to guess how the book is going to end. My only issues with the book, besides freaking me out, is how he used the boy scouts organization. There were merit badges that didn't exist and the scout law he used in the book isn't real. As an Eagle scout it always bothers me when writers bend the truth in regards to scouting. Now, I don't know maybe he had to change things up just a little bit for legal reasons or maybe the Canadian boy scout organization is slightly different from the Boy Scouts of America, and, to be honest, it's a pretty small infraction that most people wouldn't notice. It's more of a personal pet-peeve. If The Troop doesn't creep you out, I would recommend you see a psychologist to get some help. It might not scare you, but it should be a little distressing. As a recommendation, I can't stress this enough due to the high amounts of gore, violence, adult language, and sexual imagery, this is an adults-only book. After reading this book, I'm happily returning to my regular fantasy and science fiction books for a bit.